40 Used Theater Seats. Muskegon seating Used Church Auditorium Chairs. Nice! $55 each! 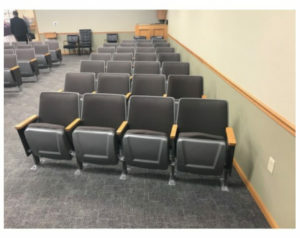 Muskegon Citation used auditorium chairs. Used Church theater-style chairs. Made in the USA, by Irwin Seating. Price: 40 chairs X $55 = $2,200 plus shipping. This lot of used theater seating contains 200 chairs. Came out of a church in Muskegon Michigan. They are in storage in the Grand Rapids MI area. We can load your truck. We provide the labor to load your trailer! Or we can help you with shipping arrangements. We can palletize the chairs (for an additional fee) in needed. Muskegon Citation used theater seats, church chairs, with fixed backs. Manufacturer: Irwin Seating. Made in the USA. 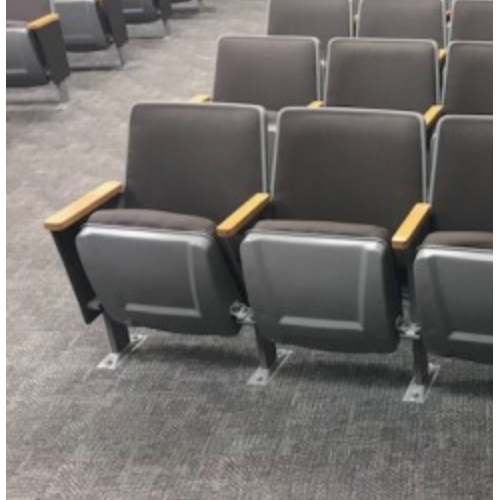 These Muskegon Citation used theater seats used theater seating are made to go onto a LEVEL floor. All of these theater chairs have fixed armrests. Real commercial theater / auditorium seating. Muskegon Citation used theater seats used theater seating. Width: Approx. 21″ (measured center-to-center). Note these chairs were used in a church, no eating or drinking was allowed! People were in their “Sunday’s Best” clothes, no street clothes. No eating or drinking allowed in the church! These chairs were cleaned on a regular bases! Please note the quality and condition of these chairs. Very nice, and very well cared for! WE will neatly and tightly stack the chairs in your trailer.